Deciding to get your kitchen renovated is a major project. It should not be approached lightly or without much thought. Where most people tend to go wrong is planning their kitchen design without considering the actual functionality of the kitchen. It is important to remember not only do you want a beautiful kitchen design, but also one that is functional and meets your needs. You need to know exactly how much you want to spend on your kitchen renovation. Do you want to reuse your existing cabinets and have them resurfaced or refinished or do you want all new cabinets? What sort of countertops do you desire? If you are considering quartz or granite countertops, remember, the cabinets need to be able to support the additional weight of these solid stone countertops. What about your appliances? Are you replacing them with new ones or keeping the existing ones? Each of these items, as well as flooring and lighting should be included in your budget. Once you have established a budget, the next step is to visit a local showroom to determine exactly what you can afford. It does not hurt to ask if the countertop and cabinet supplier is running any special promotions, deals, sales, or offers factory direct pricing. Anytime you are able to get a discount on your kitchen renovation project, it means you can use the extra money to upgrade certain aspects of the new kitchen design, such as upgrading from granite to quartz countertops. Take advantage of assistance from experienced designers and design services because these professionals are full of knowledge. They can help you customize your kitchen so it satisfies your requirements and fits within your budget. In addition, an in-home consultation allows the designer to take measurements and determine what size cabinets and countertops will work best with the layout and size of your kitchen, as well as use this information to prepare your quote. Make sure your countertop and kitchen cabinet supplier has quality materials and products. It makes no sense to invest thousands of dollars into a kitchen renovation on low quality materials you will have to replace a few years later. Remember, your kitchen design professional is there to help and can provide information about the quality of each item. A kitchen renovation quote should be detailed and contain all of the cabinets, countertops, and related materials needed to fully transform your kitchen, as well as the labour for installation. Take the time to review your quote, and if there are items missing, inquire about them before signing a purchase agreement or sales contract. By taking the time to follow these steps, you will find renovating your kitchen can be fun and exciting, without any unexpected costs. 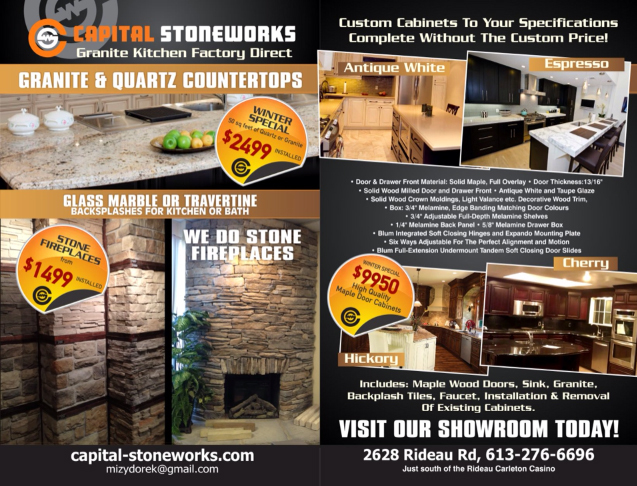 For more information about kitchen renovation services, kitchen cabinets, or granites and quartz countertops in Ottawa, contact Capital Stoneworks today at 613-276-6696. 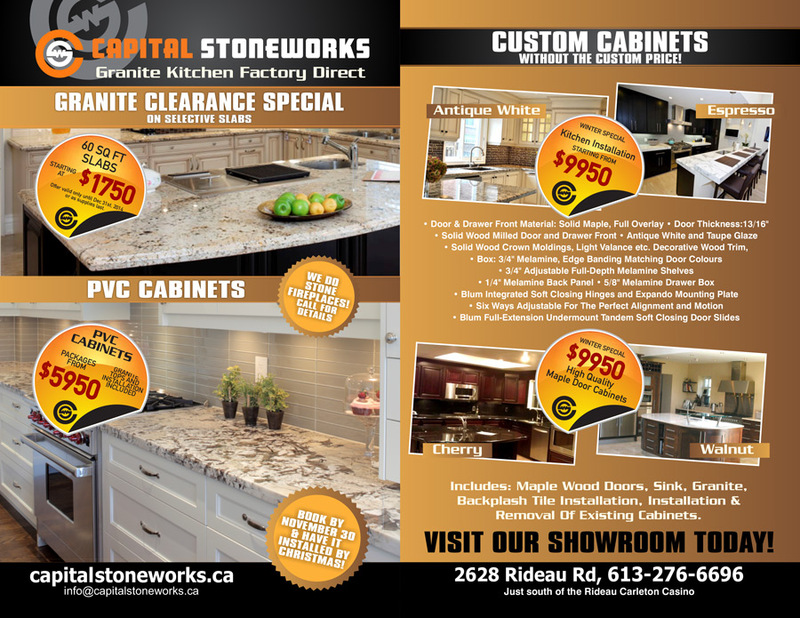 We are the leader for kitchen cabinets, granite countertops, Caesarstone, and more in Ottawa and offer factory direct pricing!